The warm springtime weather is here for the most part in NY so I thought I’d share a springtime recipe with all of you. 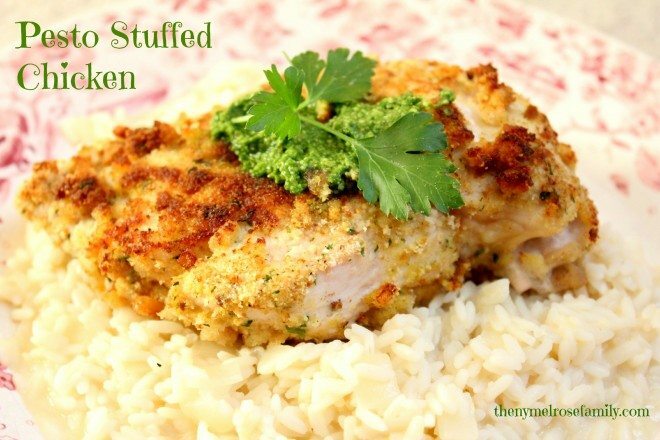 My Pesto Stuffed Chicken is packed with flavor from the Kale & Spinach Pesto, but is versatile for indoor cooking with it’s crispy crust that is pan fried and then baked through. Looks like the perfect chicken if you ask me! But I adore pesto! Great recipe Jenny! I love pesto!! I like how it’s hiding in the chicken. What a nice surprise! Hey Jenny – Agree with the others…great idea to fill the chicken with a tasty pesto instead of a gooey cheese. Especially when it’s a delicious kale and spinach pesto. Who wouldn’t be on board with that? Yum! Chicken and Pesto go together like peanut butter and jelly! Sounds so good. I pinned this to try! I love pesto and chicken together. Looks fabulous! That looks delicious … love the crunchy coating!